Why it makes me happy - I used to do business over the phone with GB. We never met. After playing 14 holes, he told one of the other partners who he was and what he did. It was then that I went, "hey! I know you!" It was definitely an epiphany...and a HappyUP!!! Why it makes me happy - everyone on the team chipped in....and I definitely held up my end. I was probably the anchor today on our 4 man team. It was a team effort and we came in the money. Why it makes me happy - I was heading home from the golf course and I was starving. I remembered something....I had BBQ'd some chicken thighs day before yesterday and I had some TraderJoe's French Lemonade in the fridge. A chicken sandwich with my favorite drink ...a delicious HappyUP!!! Why it makes me happy - I have seen this movie a couple of times.......and it lured me in again. It's just a cool movie. Why it makes me happy - it was great to see C, find out about a recent journey....and find out what else has been happening in C's life. Why it makes me happy - this is going to a HappyUP!!! for many weeks to come. Who knows..the group is progressing nicely...a HappyUP!! !...they may not need my help that long. It's nice to be in a room...in a meeting...where people are serious about improving and being one of two people in the room that can help them. Why it makes me happy - this is one of those home improvement projects that actually went really well. I can do things around the house but, many times, it's a circus of having to make trips to the hardware store. Not today! Why it makes me happy - breaking bread, good conversation, and a restaraunt I hadn't been to. Why it makes me happy - I didn't hit the ball very purely today....which makes it tough to play in the wind. When I hit a great drive and a 9 iron to 3 feet, it made the rest of the day worthwhile. It's not all the time that you get a kick in birdie on a par 4....especially 18 at our club. It was a nice finish to the day. Why it makes me happy - grabbing a bite with a friend, I have found, is always a highlight of the day...especially when nothing too heavy is going on. Good meal...good conversation. Why it makes me happy - money isn't everything but, in these times, it's good to see the value of the assets climb. Why it makes me happy - 9 plays tough for me. I have a heck of a time putting my ball on that green in two shots. It's a tough green because you have to be on the right place on the green. I wasn't there today....I missed in a bad spot. I hit an awesome shot up the hill that rolled up for a gimmie. What Do You Have to Hide? 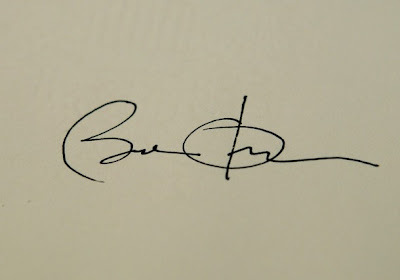 The Obama - was just on TV pitching his "Recovery.org" website where all of the money that is being spent will be available for everyone to view. It reminds me - of a mantra we had in my workplace.....the Open Kimono. Unfortunately - it ended up being more of a mantra than what actually ended up happening. The idea was tremendously - well received. Everyone wanted to know what was going on........ with other people and other departments. With all the shenanigans - we have seen in our economic collapse that drove the country to elect a president that probably would not have made it without it, there appears to be a thirst for transparency. Yet......will you be transparent? - "Be the change you seek" is an old adage as YOU are the only thing you have the ability to change. What do you have to hide? - this is not to be read with a "what the heck, what have I got to hide?" attitude. It's a serious question. What are you hiding?......and will you be willing to bring it out and let the light of day shine on it. If you aren't willing - you don't really want transparency. Why it makes me happy - practicing putting is not my favorite thing to do. Since starting back with golf, I would say I have only gone out for about 2-3 serious putting practice sessions. I ground for a good 45 minutes today. I need another session tomorrow. I think I am on to something. I hit a GREAT putt on 8 that I don't think I would have hit without the session. I made solid shorter putts on 5 and 6 as well. Why it makes me happy - the pin was up front. You have to stay under the hole or you have a miserable downhill putt. To do this, you have to accept coming up short. I hit the shot a touch heavy but with lots of power. This left me right on the front edge. If I had hit the shot perfectly, it would have been pin high. It was a thinking man's play that gave me a shot at birdie....wish I had hit one of those perfect putts here. Why it makes me happy - anytime you hit a solid shot in golf, it's a HappyUP!!! in the moment. Today, in 9 holes, I had a bagful! Why it makes me happy - love Wah!....it was cute watching his kids smack balls on the range. He was being a good dad. Why it makes me happy - "the financial crisis that we have inherited is serious." I caught our president violating one of the Four Agreements. It wasn't required that he do the finger pointing...nobody is blaming him for this. He is another guy that doesn't get it....I am sick and tired of finger pointing. I think a lot of Americans are as well. Anyway, it made me happy to catch a slip in character. Why it makes me happy - I'll have lots of bread breaking and meaningful conversations over the next week. Why it makes me happy - he is involved in a new venture.....and it seems to be doing OK. HappyUP!!! Why it makes me happy - I was able to have a couple of snappy conversations with friends...fun staying in touch! Why it makes me happy - I thought I may have added a little more Nutster to the Nutster this week. As it turns out, it was about even from last Sunday. January is off to a good start in this department. Why it makes me happy - I haven't seen J in forever. We'll get to do some catching up over breakfast on Tuesday. Something to look forward to. Why it makes me happy - we had a spot open and we always like it when Wah comes along. Why it makes me happy - Boz, Wah, and I got to do some non-golf chattering as we waited until the real HappyUP!!! came.....the rains stopped and we got in 18 holes when, once again, the weatherman was saying it wasn't going to happen. Why it makes me happy - I hit about 8 pure shots from the fairway today....some of them even went the right distance! The putter continues to fail me but that just means a few hours on the putting green. This is the charm of golf....you hit it bad but putt well. You hit it well and then putt poorly. I think I can get the putter squared away while the ball striking is going well. Why it makes me happy - very few things feel better than pure shots. Ben Hogan said he was lucky to get one or two a round. My standard may be lower than ol Ben't right now but I had more than a couple. Why it makes me happy - it's nice to have some unexpected fun laying out there in the future. Why it makes me happy - I am sure my friend will pull it off. My friend was gracious in thanking me for some minor assistance....but it's all my friend's doings to make it happen. I can't wait to hear how things turn out. Why it makes me happy - my golf partner and I were joined on the tee by a couple of buddies. Why it makes me happy - I play a tough course. I am averaging over a birdie a round now. I really should have had 4 birdies today....it will come. The course was wet...the course was playing long. When golf season hits, I am going to be ready for it. Why it makes me happy - there is something about hitting a long iron on a par three right at the flag that may be one of the best feelings in golf. There is also the chance for an ace....this one ended up 5 feet from the hole. Why it makes me happy - while I try not to take things personally, it's always great to have someone pass along a nice word of affirmation like this. Why it makes me happy - my favorite waitress told me all about her pole dancing lesson that a lady gave her and all of her girlfriends....c'mon....you know that is a HappyUP!!! What can I say? I'm a guy! Why it makes me happy - it has been a dry winter.....and the last two haven't been overly wet either. I get stoked every time it rains because of that. It also is neat to lie in bed, hear the drops, and know that you don't have to go out in that today. Why it makes me happy - I really like the Toastmasters Club that I have volunteered to help get up to speed. I had done this with another club years ago and had forgot how enjoyable this is. Meeting new people who are eager to learn......when you have most of the answers.....heaven. Why it happened - I said, "what the heck"
Why it makes me happy - it was rainy yesterday. After my mentoring session (see above), I decided to buzz over to the golf course to get in 9 under cloudy skies. I popped in a cart and ended up catching up with a couple of very good players who invited me to finish the 9 with them...good golfing companionship is always a HappyUP!!! In the previous segment - we were delving into not taking anything personally because the "stuff" that gets flung your way by others is not your stuff. It's the stuff of the thrower because....well....uh.... he/she was the one that threw it. You are the target of the toss - because of a fear that is haunting the other person. It could be pressure they are under from their boss....their spouse...their kids....any of the places that you used to feel pressure from until you adopted the Four Agreements. Let's move on to yourself - you shouldn't take anything personally from yourself either. "Whoa...Nutster....what are you talking about" - I can hear you already. Hang with me for a second. Most of you are familiar - with that fine Christian tenet that says, "thou shall not judge." It's a great piece of wisdom. Many of my Christian friends are surprised when I mention that line includes themselves. One could make a case that it's first priority would be to not judge oneself. The bottom line - we really aren't that good at it. God is the only one qualified for the job! There just is no way to know - why people are who they are....even yourself. It's part of the great mystery of life. ...but once in awhile - you actually hear "that voice." According to Don Miguel Ruiz, the Toltecs called these voices the Allies. The Europeans, Africans, and Indians called them Gods. The mind can talk and listen to itself - part of the mind listening...part of the mind talking. Get 1000 parts of your mind speaking at the same time and you can see where big mental health problems can exist. It's like being on the floor of the stock exchange during a panic trading session. Each voice has a different view. The word Ruiz uses for this confusion is a mitote. No matter what it is called - with all of these voices going on in a person's head, it is the reason people hardly know what they want, how they want it, or when they want it. There is a voice that wants one thing and another that wants the opposite. ...and you are supposed to take the confusion - and take it personally? Sounds a bit ludicrous to me. Don't Take Anything Personally.....from others or yourself. SIDEBAR - people are so used to all of these voices going in their head that silence and meditation are actually quite scary. If the mental chatter was reduced, clarity would be achieved. Never forget that, no matter how they present themselves, most people live in a mental construct of chaos. I have a saying, "when chaos is your companion, peace will not seem like a friend." When we really see - other people as they are without taking it personally, we can never be hurt by what they say or do. Even if others lie to you, it's OK. They are doing it because they are afraid. They are afraid you will discover they are not perfect. It is painful to take off the social mask they wear. Why do you think that "transparency" - is such a sought for commodity? It is because it is so rare...and precious. When you are in the presence of a soul that is transparent, you walk away not believing how "real" that person is. When you are a keeper of the Four Agreements, you gain that transparency. I love how Ruiz ends this chapter in the book - "if you keep this agreement, you can travel around the world with your heart completely open and no one can hurt you. You can say, 'I love you,' without fear of being ridiculed or rejected. You can ask for what you need. You can say 'yes' or you can say 'no' -whatever you choose- without guilt or self-judgment. You can choose to follow your heart always. Then you can be in the middle of hell and still experience inner peace and happiness. You can stay in your state of bliss, and hell will not affect you at all." Why it makes me happy - I used my camera to tap this one in for the birdie. What can I say....there are few things in life that feel as good as a perfectly struck 4-iron. Why it makes me happy - my friend was having an issue........that had been caused by a violation of Taking Something Personally. My friend e-mailed me about what to do to fix the error. I put in my two cents......and the outcome of the situation was positive for both parties involved. Why it makes me happy - in our lives, we have people that we become friends with...and they drift away. Nothing major happens....they just drift. It was super to reconnect and find out that life turned out very positively. Why it makes me happy - I shot the best score that I have had in about three months....and it easily could have been better. I was playing well back then....I started to think it may have been a fluke. My game is coming back around which is energizing me to entertain a wild dream. Then, at dinner (see above), my fortune cookie talked about having a dream and making it happen. It is weird because, for the first time, I actually disclosed my dream to my golf partner today. "I don't believe in pessimism. If something doesn't come up the way you want, forge ahead. If you think it's going to rain, it will." Today, we tackle the second agreement - which is tied in very closely to the first. Remember, your words effect your beliefs. You believe in words. This one is going to take a few posts to get through- because I received so many e-mails saying, "I can't wait to hear 'taking things personally'." Once again, I will be tossing some of my thoughts on top of Don Miguel Ruiz' writings. When we don't take anything personally - we are looking at how we process others words or their actions which we translate into words. "Sticks and stones may break my bones but words will never hurt me" - some of you are believers in affirmations. You may be hesitant to use this old one.....but why? It may be easier when you realize WHY you shouldn't take anything personally. If I call you "stupid" or "lazy" - it's not about you....it's about me. If you take my "stuff", it is going to be problematic. I was in a car on a trip with three other guys - not long ago. I'm retired but I had my laptop up and plugged into the internet doing some stock trading. One of the guys is a person that I have known since high school but don't see that often. I like the guy but he always seemed to think that he was "cool" and better than others. He called me a "nerd" - for being on my laptop. Now, keep in mind, I was also getting weather reports and discovering other information that we were talking about during this trip. He was actually trying to fill his need to be superior to other people. This was his "stuff." When I heard it, I immediately went to myself, "wow....he just tried to hurt me....but I know this guy and it is something that he suffers with." You tell me - was I a nerd? Actually, I really don't care what you tell me....it doesn't matter. Do you get what I am saying here? Do you "get it"? Yes....the "cool" people - they are one of the easiest sufferers to spot....and it gives me great joy when I ferret this type of thing out. I do not get joy from their suffering....I just need to take care of myself. "Nutster, you are the best"...."Nutster, you are the worst" - you could tell me these same two things....you could even do it in the same day. How schizophrenic would it be for me to give either of these any type of regard? Why do you take these things personally? - are you a victim looking for acceptance in the world? Accept yourself...it is all that you need. Whatever you think...whatever you feel - I KNOW is your problem and not my problem. Others have opinions based on their belief system - (and beliefs are formed in words...and we already know that people are NOT impeccable with their word) so nothing they think is really about me. "Your words are hurting me" - is something you could hear. Well, you probably won't if you become Impeccable With Your Word. Until then, know it is not what you are saying that is hurting them. It is that they have wounds that are touched by what you say. You see the world as a movie - you are director, producer, and main actor/actress. Everyone else is a secondary bit player in the movie....and YOU hired them. It is your movie. The way you see the movie is according to the Four Agreements. If you get mad at me, I know you are dealing with yourself. I am the excuse for you to get mad. YOU get mad because YOU are dealing with FEAR. If you are not afraid, there is no way you will get mad at me....no way you will hate me. If you are not afraid, there is no way you will ever be jealous or sad. WARNING - this is a tough way to live. In the corporate world, I had a boss who had a "thing" for me. He would try to humiliate me in public and bring me down...even though I was deeply loved and brought in great results. I knew this person's story and there was a lot of pain behind it. As I watched his movie and saw this pain, I saw it as quite comical to how he sought to overcome his pain with power, status and prestige. I never commented or became a critic of his "film" but I was forced to view it due to the corporate structure. In the end, my unwillingness to play the role he wanted in his horror/comedy film drove me to leave my position after many years. I could have behaved differently - and the company paid people to get me to. There comes a point, however, when you have to realize that the training you get may be good for others but it isn't going to make you a better person. This is very common in executive "development" and may play a hand in the shape of today's corporation. Answer to WARNING - it may a tough way to live.....but there is no better way to live than to be true to yourself. More parts to follow - your exercise until then? Write down this agreement in as many places as you need to. Do it....right now....yes....NOW. You will forget about this as you go through the day. You need to be acutely aware of the Black Magic that others try to force upon you. I want you to take note of when someone says something and it kind of "hits you" or wants "to stick" on you. Then, analyze it and ask, "hey, is this my stuff or is this his/her stuff?" If it isn't your stuff, either give it back or toss it in that trash can by your desk. HappyUP!!! Day 723....Change - We Can Believe In? Change - as someone that managed people for years and specialized in managing people through change I can say one thing unequivocally: people don't like change much. They say they do but, when they realize that change requires changing oneself which is accompanied by work, they lose heart. While not a theologian - I absolutely love the story that Exodus tells in the Bible. All of those slaves go, "Sure, Moses, get us out of here." As soon as things get a little rough, they backslide in a heartbeat. "Hey, those beatings and that food wasn't as terrible as we thought." The vision of the Promised Land fades quickly. "Who the heck is this Moses guy, anyway? He spun a great story when we were back there in the pits but THIS sure doesn't feel too good." Me? 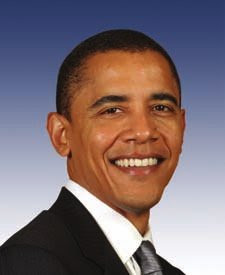 I'm optimistic - Is The Obama the real deal? Who knows? He sure doesn't have much experience. He's a good cheerleader. He's a good motivational speaker. We need those things. We'll need more from him. Yet, the team still has to play out on the field. You may remember my post yesterday - where I asked if you were ready to do at least a day a month of volunteer work. If you already do that, you will be asked to do more. It's funny because I just heard a commercial from The Obama wanting you to log in to a website for volunteerism. Will you be willing to give more of yourself - when, due to economic circumstances, everyone feels that they have less? Why it makes me happy - it was hard to imagine a more perfect day than today to be basking in the gorgeous weather.....just a stunning January day. Why it makes me happy - I met another new face to me at the club and ended up playing with three people outside of my circle. I didn't put up a great number but it was good company. Why it makes me happy - I actually was down the middle on 6 with an 8 iron and tugged it slightly or I would have hit the first 6 greens. This is an accomplishment because the first 5 holes at our club are a tough way to start. A day dedicated to service - how is that for a HappyUP!!! from the president-to-be? Time and again, he has said, "I can't do it alone." Do you smell a little "ask not what you can do for your country but what your country can do for you," coming? It's got a nice ring to it - it worked for the original guy that coined the phrase. So, do you think that the Obama is going to ask for one day a month of volunteerism from every American? So, what do you think? - can you get on board with a volunteer day a month...at minimum? The Obama is right....he can't do it on his own. YOU have to do the lifting. Why it makes me happy - I dealt with two insurance companies and an appliance store all in about 15 minutes...no hassles...all outcomes desired...minimum hold music or frustrating voice mail phone trees. Why it makes me happy - I didn't get to the end of this project...but I made a nice dent and got the garbage into the trash can before the garbage truck came. This leaves more room for more stuff tomorrow and, possibly, no trips to the dump. Why it makes me happy - OK...it was just sticking some nails over the back porch and hanging a drop cloth. It is a prototype. The main thing is that the system will work to give me a nice backstop to hit pitch shots into....aggressive pitch shots. This is going to help my short game out big time. Now, I just need to go get the more permanent items needed. Why it makes me happy - we made a trip to Wide World of Golf and demo'd some new clubs on the simulator. While the irons that I want don't come out for a couple of months, it was neat trying out some new stuff. Why it makes me happy - I used to work for a mortgage company that was a department of a bank. The bank was closed on this national holiday. We weren't....but most of my employees would take the day off anyway. While I put the smile on my face, I never felt that this was right. If people wanted to work, we could have closed but people could come into the office...just like the weekends. No confliction for me today. Why it makes me happy - we shot 8 under today....and it easily could have been 12 under. We had a bad start yesterday but today proved that we really can easily be competitive in this format. I think they'll be having this one again next month....and we'll be there. Why it makes me happy - I drove the ball very well over the two day tournament. Every one of my tee shots was very playable except for one today....and, even that one, I was taking a chance of hitting it poorly so it was no surprise. I drove the ball well enough to consider playing a tournament on this course later in the year on my own ball without a partner. Why it makes me happy - I love getting together with this friend and grabbing a bite....always a good time. Why it makes me happy - you have to have a good short game in golf. I used my hybrid 3 times and knocked it VERY close each time. I flipped a pitch shot on 10 perfectly and almost holed a pitch on 16 which left a tap in. Why it made me happy - my partner and I could not get anything going....just a bunch of pars through 5 holes. My drive was just short of a hazard...perfect distance. I hit my brand new hybrid for the first time from about 210 yards.....perfectly to with 12 feet. I drained the putt and thought that would get us going. While it didn't, it made me very happy at the time. Why it makes me happy - you like to start any round but particularly a tournament round on the right foot. I got us within a wedge of the first hole. Why it makes me happy - when it was in the air, it looked like it had a chance to go in. Now, why it landed short of the pin and went 20 feet by, who knows? It was a HappyUP!!! for awhile. Why it makes me happy - Tad is 5'1". He had to Monday qualify to get into this week's PGA tournament. He barely made the cut yesterday. Today, he vaulted past everyone and is just off the lead....in his home state. Very inspirational. Here's someone that looks to be in the midst of a HappyUP!!! - it's good ol David Crosby....one of my favorite characters in the music world. A friend of mine - shot me the photo and I saw some contentment in the picture... kind of like a cat when it purrs. Kind of a bummer on that arm brace - for his fretting hand. It's been a rough trip for the Crosb all of these years. Why it makes me happy - it was so good to visit with this person that I have known and worked with for so long. We had a nice, real conversation....just a very joyful person to be around. Why it makes me happy - many golf courses have easy par 5's.....not mine. If you are fortunate enough to position yourself for "easy" birdies, you then need to execute the delicate shots that give you the birdie. I hit a nice wedge to 15 feet and made a putt on 5. I knocked a hybrid just off the edge on 12 and then played a smart little "wedge" hybrid shot up to a few feet. On 15, I chased an iron up to the edge rather than trying to "go for it" in two. The shot was to an elevated green and I tried a shot I have been working on....the spinner. I hit it perfectly up to a tap in birdie. Why it makes me happy - I was making a mess of the second hole. Drive in the water...drop to a terrible lie...chunk.....full on iron into the bunker......the meter on this taxi was running full blast. UNTIL....I played a perfect shot that found it's way into the cup. "Nurture your mind with great thoughts, for you will never go any higher than you think." ....and the predominant thought that I have is of being about 7-9 pounds lighter in a little over a week. It works every time. Why it makes me happy - this concoction actually tastes kind of good this morning. I use Isagenix as my 9 day program. The first two days involve sucking down this liquid 4 times a day....and that is about it. When tomorrow rolls around, I'll actually start to see the results (I'll leave the graphics of what that is out of the post). Just trust me...it's a good thing. After the two days, I slide into a program that provides a bit more nourishment. At the end of 9 days, I will have dropped 7-10 pounds and have a different outlook toward my daily nutrition. It's a good thing....it's not that hard...some willpower is involved but nothing major once you know that the results will be there. My mom used to do something similar by going on a "cabbage soup diet" every so often. This is a little more friendly. Why it makes me happy - this is an old college contact.....college was....uh....hmmm...well....it was a little bit ago. We had a great conversation and I'll be getting a dinner invitation soon. Why it makes me happy - I have been in Toastmasters for well over 20 years. A local employer is starting up their own club. Today was the first meeting that they have had and it made me realize how much I know (a HappyUP!!!) and how eager and excited the group is to learn and improve (a HappyUP!!!). Put those two forces together and it becomes a HarmoniousHappyUP!!! This is the most important - and the most difficult of the four. Your intentions manifest through your words. Your word is a force that you put into the world. If you think of the words of someone like Hitler, you get a feeling for how powerful this force can be. The human mind is fertile ground - you plant a seed, a thought, and it grows. The word is the seed. You are a magician - you constantly cast spells on people with your words. Today, I will be making my first appearance at a new Toastmasters Club as a mentor. I will need to be impeccable with my word here...big time. By hooking our attention - the word can enter our mind and change a whole belief....for better or worse. Your beliefs are formed by words - what if you say to yourself, "I am stupid." Are you really? It gets down to what you believe....and you believe in words. Impeccability - comes from the latin, pecatus, which means "sin." The "im" means "without." If something is impeccable, it is without sin. Forget the religious conotation around the word, "sin." "Sin" is anything you do that goes against yourself. From this context, sin transcends moral or religious judgement to commonsense. Sin is about rejecting yourself and self-rejection is the biggest sin you can create. If I call you "stupid" - you will hate me and I have thus used the word against myself. When you become impeccable with your word - you become immune from anyone casting a negative spell on you. Your mind is no longer fertile ground for this black magic and becomes fertile for words of love (does that sound mushy? Psssst....shhhhh.....c'mon....admit it...deep down you want more of that, don't you? Your secret is safe with me). Your exercise: get a little notepad or your journal and keep it handy to capture your thoughts and observations for the next couple of days and enter them in the same place. Note them to yourself only even though they may be in regards to how others do in this category. Think of someone that you admire....how do they do with their words. Finally, you may want to get a post it note, a rubber band, or something that reminds you to be on the lookout. It is easy to read this and say you will be on the lookout but, without a string around your finger, you slide right back in to how you were. Remember, we are talking about making a change, here. Any change means getting out of your routine. Feel free to leave a comment here - or to e-mail me directly. Let's see what you discover. Why it makes me happy - I haven't seen this person in months and it is a person dear to me. Friday, we will be getting together. Why it makes me happy - the person's layoff....nobody's layoff is EVER a HappyUP!! !...let's be clear about that. I was just happy that the person is taking it pretty well. Why it makes me happy - while I am not happy that I didn't go see my pro a month ago, there is nothing I can do about that. The HappyUP!!! lies in some FAIRLY minor adjustments to some bad posture I have fallen into. I think I can get these changes incorporated fairly quickly. MUCH more power with less effort lies ahead. Why it makes me happy - we had a guest today....that was impressed enough to join. We put on a good show today. The overall vibe was extremely upbeat. Why it makes me happy - it is always good to talk to this long time friend. I am so happy that I got the call so we could catch up. Why it makes me happy - I got a free and easy blog post (see below) out of it. While I didn't do it on purpose to create traffic, I guess I was one of the first posts on Google this morning with "misunderestimated" as a keyword so NuttersNotes reached a new audience today. Why it makes me happy - I had the advice to give.....and enjoy doing so. It was also good just to visit for a bit. Why it makes me happy - the widget was really easy to install and I can, once again, monitor traffic here if I choose. Traffic isn't something I grind for but it is good to know who is peeping in. (If this is your first visit here to Nutter'sNotes, make sure you go here and find out what this "HappyUP!!!" stuff is all about.....you! "You have travelled the world with me. I have respected you. I haven't liked all the stories you wrote. You misunderestimated me from time to time......"
I am going to miss President Bush - the critics can make fun of him but he has great Yogi Berra-isms that we are not likely to hear again soon. 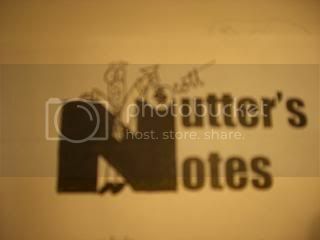 And, follow Nutters Notes in 2009 - as it continues to grow to one of the more popular blogs on the internet. To do anything less would be to misunderestimate me. Why it makes me happy - I had to answer some questions that made me think a little bit....and then turn them in. While they won't be graded, the accountability that comes with turning something in made me give them some extra thought....and I liked what I produced. Why it makes me happy - I hit a great wedge on 4, an excellent bunker shot on 6, a great pitch on 11, a tremendous flop shot on 13, a nifty hybrid chip on 14, another great bunker shot on 16, a good flop shot on 17, and another fine wedge shot on 18. While my tee to green game was not good today, my short game kept it from being embarrassing. Why it makes me happy - I am not hitting greens right now....a bad thing on our golf course. It's not easy getting it up and down. HappyUP!!! number 2 (above) is the up....the putter is the down. I made some great putts today and very few bad ones (except for that slight pull on 11). I'll get the long game fixed this week.....but the putter is the great equalizer going into next weekend's big tournament. Why it makes me happy - I got $34 back on a $15 investment. No, it's not a fortune but it let me play free, pocket a couple of bucks, and keeps me as a winner for the week. Why it makes me happy - this little duo put me on the board and in the running to get a skin in the tournament today. I took the extra club to get the ball all the way to the back of the green and took dead aim. I read the putt perfectly and put the perfect stroke on the ball. Birdie! Why it makes me happy - I got some extra time to talk with different guys in the clubhouse before we all played. When we got out on the course, it was absolutely beautiful out there. The fleece came off on the first hole and it was a perfect day for a nice long walk around the course. Why it makes me happy - I grew up loving football. I don't follow it much these days...but I do like the playoffs. 18 holes of golf....and then two playoff games. THAT is a nice day. Why it makes me happy - I got home from the golf course and did what golfers do.....I flipped on the Golf Channel to watch the 2nd round of the Mercedes Championship. Hey, it's the first tournament of the season....kind of like opening day for baseball season. As I was reclined in the AggressiveBoy lounger, Stogie jumped up on my lap. That's no big deal. He does it all the time. What has never happened is that we were joined in our golf spectating by Shadow, the girl cat. There I am, a cat on my lap, another cat wedged between my leg and the arm of the chair, a cat head in each of my hands, while watching golf. It was a family moment. Why it makes me happy - I could go on and on here. R and I were joined by a guy we played with a couple of days ago....we like him. He is going to join us again in the morning. We were also paired with another interesting guy...very interesting...I'll get into that in a minute. We were able to have a good match with no strokes given. R and I prevailed to win a bet. I made a couple of birdies on the back nine. I got up and down on 17 and 18 which proved critical to preserve the win. My score was pretty good...even with four 3 putts. It was a nice day on the course. Why it makes me happy - ANY birdie will be a HappyUP!!! contender. When you make a birdie that you don't have to putt because your opponents give it to you, there was a HappyUP!!! involved as you watched that shot creep closer to the hole. Why it makes me happy - C has some cool cars......Porsches.....hot Porsches. He is also building cars to try to become the Carol Shelby of today. On Tuesday, I get to stop by his garage and see the first car that he has made before it heads off to the racetrack. Oh yeah.....this is a serious vehicle. If it's not a secret, you'll see some pictures on Tuesday. Today - we start something new here at NuttersNotes that dovetails into the overall vision of helping everyone increase their amount of happiness as they sojourn this orb. 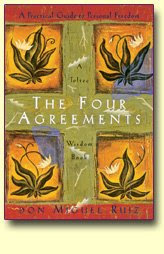 ...and I am very excited - to begin a discussion of The Four Agreements, by Don Miguel Ruiz, one of the best books in the field of self improvement that I have ever read. In my working days - my staff was used to us starting every meeting by reciting and discussing the four agreements to establish the ground rules in which we would conduct ourselves during our time together. Today, we will begin our discussion - with an overview of what the Four Agreements are. I urge you to cut and paste them to a printable format. This will allow you some time to just read the agreements and attempt to guess at what they mean to you. At some point - you will want to buy the book as Ruiz will go into detail far greater than we will here. I will be sharing some of my interpretations as well as applications that they have made in my business and personal lives. This is going to be a tremendous, life changing series - so, if you are ready, start looking at the above and pondering what these words could mean to you and how abiding by them would change your thinking and day to day behaviors. Had a Blizzard Lately? - I really shouldn't promote fattening food items as a HappyUP!!! but I just have to. At the same time - go over to DQ.com and click the Blizzard of the Month Icon. You can join the Blizzard Fan Club there. It's cool (I know...nice pun). You get some nice coupons during the year. And, sorry Richard Simmons, - a Blizzard is always a HappyUP!!! Chocolate French Silk Pie is my "go to" Blizzard. Why it makes me happy - he said, "nice work," and he should know. This guy can flat out cook so this was high praise indeed. 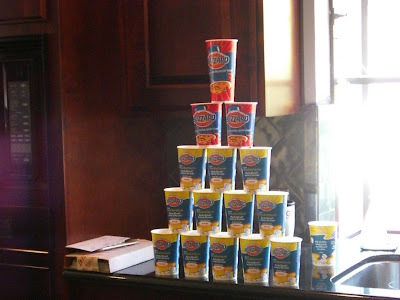 There's another reason to have the Ka-bob's. They now have the official.....well, the unofficial official.....G seal of approval. Why it makes me happy - he presented some ideas on things that I could do with my investments.....and we got to visit. A good meeting where info is obtained in enjoyable company is part and parcel to a HappyUP!!! Why it makes me happy - while I enjoy meeting up with my friend, I was in a "home alone" kind of mood tonight. Why it makes me happy - I was able to do a considerable amount of cleanup by being able to place files that were laying around. I have room to put more files there and will relegate some of my reference files, the non-working ones, out to that cabinet and out of my prime filing space. A few days ago - one of my HappyUP!! !s involved a money saving idea that I promised to share. This is a GREAT one. If you are a vegetarian - this won't help you out much...sorry, maybe the next budget stretcher will help you out. If you like steak - this is for you. Have you seen what a single rib eye costs? - it can be anywhere from 8 to 11 bucks...easy! That is enough to make one become a Economic Vegan. I am here for you - check out Filet Mignon...uh....I mean London Broil. You can get a big slab of that for around $4.....and turn it into Filet Mignon. Shhhhh - don't tell anyone what you are doing. Step 1 - get yourself a piece of London Broil. Throw some garlic salt (or regular salt..or tenderizer) on it and then FORK THE CRAP out of it. After you make some good size holes, this would be a good time to pour on some Worchester or Soy Sauce or whatever you like on your steak. Fork it some more.....this is the key. Forking TENDERIZES and is what is going to make this seem like a filet. Step 4 - "hey, the filets are ready," is the next thing that you say. FACT - when people get meat on skewers, they will eat less. In addition to your base cost being less, so is your consumption per plate. I find that I get about 5 pretty full skewers from this. Your meat cost is about 80 cents a person. Just right - in these days of a challenged economy. Why it makes me happy - we play a friendly game for a couple of bucks....and it's always better to win the $ than to lose them. Today, I won a couple of wagers. Why it makes me happy - 16 is a scary little hole. It's easy to hit short (in the lake) or long (tough putt) or right (impossible to get up and down for a par). Today, I hit it within 12 feet and drained the putt. Why it makes me happy - everyone loves it when I burn them a quick taco. Food and fellowship is a HappyUP!!! Why it makes me happy - yesterday and today would have starting the year all over again....for the umpteenth time.....from scratch. That is the way it is when you work in sales management at a large corporation. I REALLY have appreciated the last couple of days as I have taken in the drudgery of starting up the New Year. Why it happened - I have skills? Why it makes me happy - I was just going to practice today. After hitting some balls and then putting for a bit, I was invited to play the back 9 with one guy I know and three other guys. On the first hole I played with them, I rolled in an impossible hybrid chip shot from 50 feet with 8 feet of break. A good start is a HappyUP!!! On the final hole, I knocked a 7 iron about 12 feet from the hole, read the uphill putt with a little left to right break perfectly, and then hit the putt where I wanted to. THAT birdie saved me about $10...HappyUP!!! Why it makes me happy - free food! Also, the person that was giving the talk is sometimes on CNBC.....a super bright Wharton Business School guy. It was a good talk explaining more of what has happened. I got a chance to talk to him about a theory that I have had...most people I talk to aren't qualified to shoot holes in it. He was able to give me some insight where I may have been off a bit.....that's a HappyUP!!! because, for the life of me, I could not see how we were going to get on track economically. I am not sure this guy's analysis was right regarding my thesis but he could be which is more than anyone else has been able to be. Why it makes me happy - E is a good friend and I love it when we break bread together. We shared some good info this morning....and pancakes! Why it makes me happy - while never "free," I am pretty inexpensive! Har Har Har...hadn't seen this friend in 2009 so it was good catching up. Why it makes me happy - my friend and I will be playing in a Big Boys golf tournament this weekend. I haven't played in one of these in 20 years. The kids are stronger and better than they were back in my day so the "old guys" are going to need to do some fancy shooting to compete. This event is actually one of the ones that inspired me to want to get my game back in shape. I am still not in game shape to play an individual tournament but we'll be competitive in a partner's affair. Why it makes me happy - I am very happy that I did not suffer a house fire....but my heart goes out for my neighbors down the block who had that happen last night. They spent such a long time living in that remodel/addition. It made me very sad this morning.....but it reminded me to be grateful for everything that I have. Why it makes me happy - we had a frost delay which was going to throw my day off. The round of golf I played was as vanilla as it comes. It was possibly the most vanilla of a round I can remember playing. Nothing too bad happen and nothing extraordinarily good happened. I got to play with a couple of guys that I don't play with that much. The fellowship was better than the tube any old day. Why it makes me happy - we won! I pocketed a couple of bucks....HappyUP!!! Why it makes me happy - I was going to get a morning coffee. The police officer alleged that I ran a red light. I don't run red lights....unless I just wasn't paying attention. It was possible. I didn't argue with the officer. My driving record was clean....and it still is. How do you like those flashing lights behind you? Why it makes me happy - I went back to my notes of a couple of months ago when I was playing well. I got to the course early and did more than just warmed up. I actually had a practice session in the cold. I may be back on to something. Why it makes me happy - people think it takes a degree of skill. I think it is the lazy man's way to get the ball up and down. I was perfect in this area today. Why it makes me happy - it was only 5 months ago when I was a new member. I knew no one. Now, it is my turn to make people feel welcome. Why it makes me happy - I could have walked off that green with a par. I read the break perfectly and hit the putt where I wanted to. Any birdie is a HappyUP!!! Why it makes me happy - in the wind and rain, I hit a wedge into hole 1. Hole 2 has been problematic for me lately. In the crummy weather, I knocked it about 20 feet from the hole. I just need a little good weather to work on my swing...get another lesson....and I'll be back on form. I know - you want a really cool sweathirt, don't you? Hey - don't start off the New Year with envy. It's not an admirable trait, you know. ....and make sure that what you want - in 2009 is meaningful...really meaningful. The times we are in - give everyone an excellent opportunity to realize what is really important. ....and join me - by taking the HappyUP!!! experience and adding it to your daily routine for the next 21 days. Why it makes me happy - this was one of those shots that feels like you don't even hit the ball.....I had previously hit a similar shot two holes before...but it was the wrong club. Not on 13....the ball was dead on to that back pin position and had a chance to be an ace but came up 7 feet short. Why it makes me happy - I found a place to get a propane cartridge refill.....on New Years Night. I don't want be without heat in that golf cart should we play golf tomorrow. Raleys was the third place I went to...and last resort this evening. Why it makes me happy - my buddy and I stayed warm today....on a day that got cold. We were almost going to shine the cover and the heater. We actually circled back to the car to get set up. Why it makes me happy - "Fishsticks" used to be "one of the gang" in high school. He's a good guy but I never get to see him. He is married and has a family...all that stuff, you know. It was nice to visit with him after I finished up golfing. Why it makes me happy - glad to hear my buddy survived New Year's Eve......and a pleasant phone call ensued. Here's another person I will be seeing soon.